Do you have a missing tooth that impacts your confidence? Are you hiding a beautiful, beaming smile behind self-consciousness and stress over your appearance? Our denture clinic in Brisbane can change all of that for you, helping you regain that …read more. Do you have broken or cracked teeth? Are you tired of having to contain your joy each time you’re happy by hiding behind a fake, closed-mouth smile? Are you ready for the world to see the wonder that is your charming smile again? A consultation for …read more. 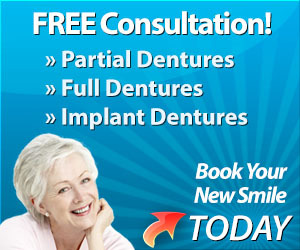 Are you concerned to enquire about Brisbane dentures because you think it might cost too much? Don’t be! West End Denture Clinic have a range of affordable options, so there’s bound to be the perfect solution waiting for you! Book in an initial …read more. It always seems that no matter how much you try and protect them, teeth are often the first to go when it comes to sports collisions. Like with many sporting injuries, the longer you leave your damaged and broken teeth unattended to, the harder it will …read more. Custom Designed Dentures at our Brisbane denture clinic. Reconstruct your smile today, with teeth replacing dentures from West End Denture Clinic. With 20 years of experience in the denture industry, our clinic aims to provide you with not only the most exceptional service offered by any Brisbane …read more. Getting denture repairs in Brisbane shouldn’t have to be difficult, painful or time-consuming. In fact, if you go to the right denture clinic it should be the opposite of all those things. When you choose the right place for denture repairs in Brisbane …read more. If you happen to be missing a tooth or two, then maybe you’re wondering how you can get your full smile back. After all, walking around with a gap in your grin can be difficult. It can make it hard to perform everyday interactions with confidence …read more. Nothing lasts forever in this world—especially your teeth. You use them several times each day, so it’s only natural that eventually, they start to decay. Ultimately, tooth loss affects a large number of individuals, especially after middle age. In these …read more. Dentures provide an excellent way for people who have experienced tooth loss to regain confidence and preserve their appearance, but dentures aren’t always necessarily very comfortable. That’s because your mouth isn’t made from the rigid materials that …read more. If you live in Brisbane and you’ve been using the same old pair of dentures for years, you might have started to notice that they just don’t fit you quite the way they used to anymore. Maybe they’ve become stiff and sore in your mouth. It’s also possible …read more. Dental hygiene needs to be taken seriously if you want your teeth to remain in good shape in your senior years. You ought to brush your teeth at least twice a day and ideally after eating to ensure your mouth doesn’t provide the perfect conditions …read more. The most common piece of advice the senior generations give to youngsters is to be more confident, and that’s because confidence can improve your life tenfold. Confidence can help you land your dream job by showing employers you’re the right …read more. The rise of smartphones and the Internet revolution has changed our lives forever, but one of the most noticeable differences is that we take, see and share many more photos than we did previously. No longer do we need to get films developed in a store …read more. As you grow older and start to reach your senior years, you may need dentures to replace cracked or missing teeth. In fact, you may not realise it, but a huge number of middle-aged citizens in Yeronga already have dentures installed. Broken and …read more. If you have missing or cracked teeth, you may have started to lose confidence in your looks, or you may be having trouble eating. The exposed areas may be sensitive to hot and cold, and they provide an ideal breeding ground for bacteria. To address the …read more. Affording high quality dentures that fit your mouth the way you’d prefer is not always as easy as you’d think. You’ll need to find a skilled dental clinic who cares about the overall look at feel of your dentures. When searching for a trustworthy …read more. When you need dentures, you don’t want to go somewhere without a good reputation. When it comes to the health and look of your mouth, you want to be sure you’re in trusted hands. Knowing that you’ll be able to love your smile again is a promise that all …read more. There are certain things with which you will never want to cut corners. Finding quality dentures is one of them. Your smile is often the first thing people notice about you, so you’ll want to make sure you impress them with realistic looking …read more. Are you beginning to think you might need dentures? People often purchase dentures for different, yet valid reasons. Some might find they are having trouble eating and need better support in their mouth. Others might consider buying dentures for cosmetic …read more. Some branches of medicine are akin to artistry. Dental prosthetists, for example, must have an excellent eye for detail and ability to create amazing looking teeth that aren’t too perfect to be believed. Finding this delicate balance is an artwork …read more.